I’m not a big fan of watermelon so watermelon wine doesn’t sound too good to me at all. I’ve seen watermelon vodka and watermelon martinis. They don’t sound good either. I don’t even like watermelon flavor gum or candy. When I was a college freshman, of course I knew everything. I had a roommate, Monica, who also knew everything. Between the two of us I guarantee there were no unanswered questions. One weekend I returned from a trip to my grandparent’s house with a watermelon. It wasn’t a big watermelon, just the right size for two. They had a garden, some things purposely planted and some volunteer. 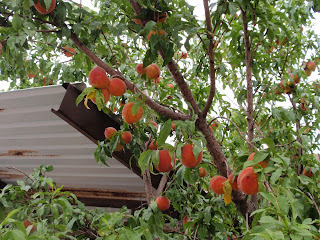 The watermelon vine was a surprise, especially when it was covered with fruit. Monica was a military brat and had lived in many places, including countries overseas. I grew up in the city and was very worldly myself. Together, we decided to make a ‘plugged’ watermelon out of my little gem. We had tasted one recently and decided it was just the thing to do. 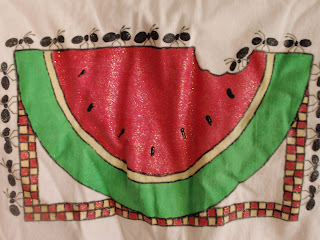 Watermelon painted gift bag from my secret pal...years ago. 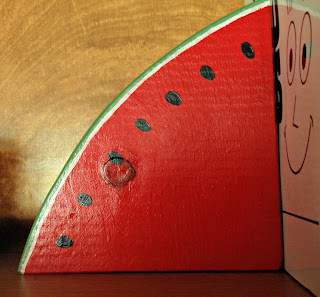 A ‘plugged’ watermelon is created by slicing about a 3 inch piece out of the melon. 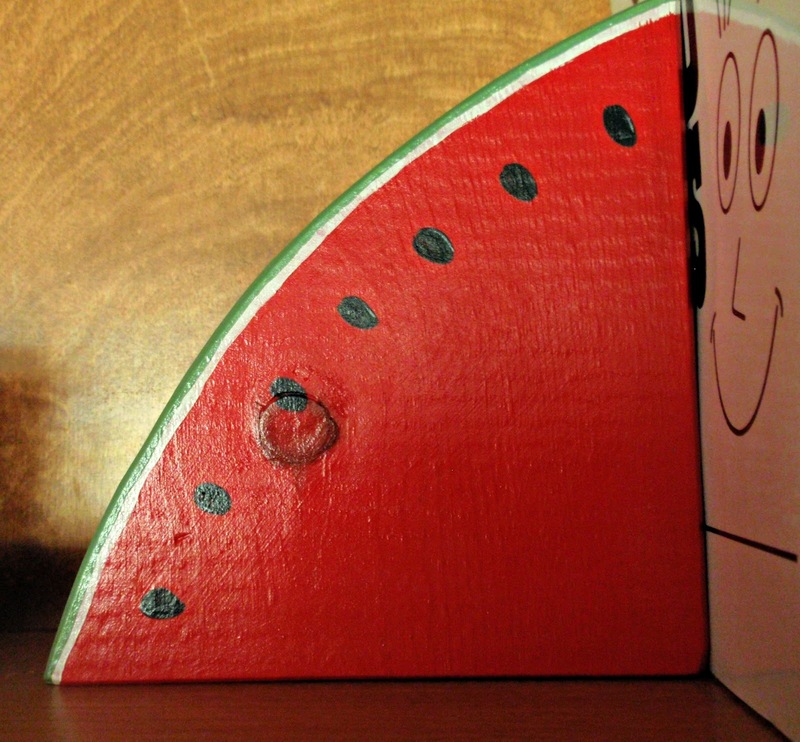 Clear liquor is poured into the watermelon and the plug is replaced. It then sits for a while, even overnight, preferably in the refrigerator. When it is ready it’s sliced and enjoyed. 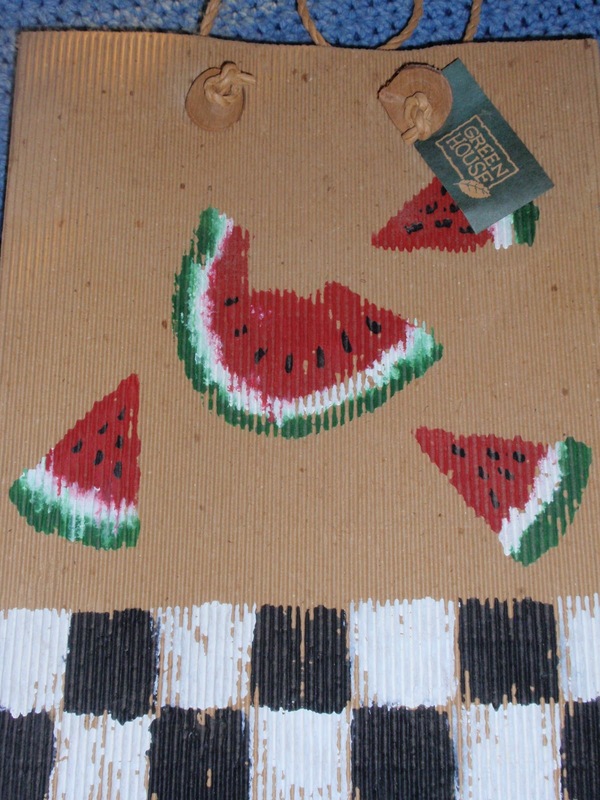 The watermelon has become permeated with the liquor and becomes a refreshing snack. Easy peasy! We were anxious to start! There was some liquor in our room. The drinking age at the time was 21. We were both 18. I don’t know where the booze came from but I’m sure it was hers, not mine! Together we prepared the watermelon. I cut out the plug and inserted a skewer a couple of times to make passages for the liquor. Monica began to pour the liquid out of the brown bottle. When she was finished I replaced the plug. 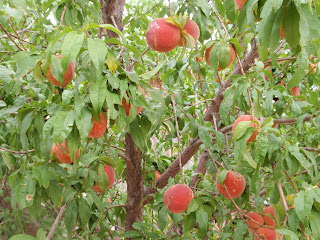 It wasn’t easy but we waited patiently for the fruit to become ready. That evening we could wait no longer. Monica spread out some newspaper while I got a knife. We were finally going to taste our masterpiece! In anticipation of a culinary delight, I placed the knife against the rind and pressed it down. I sliced back and forth until it was cut into halves. 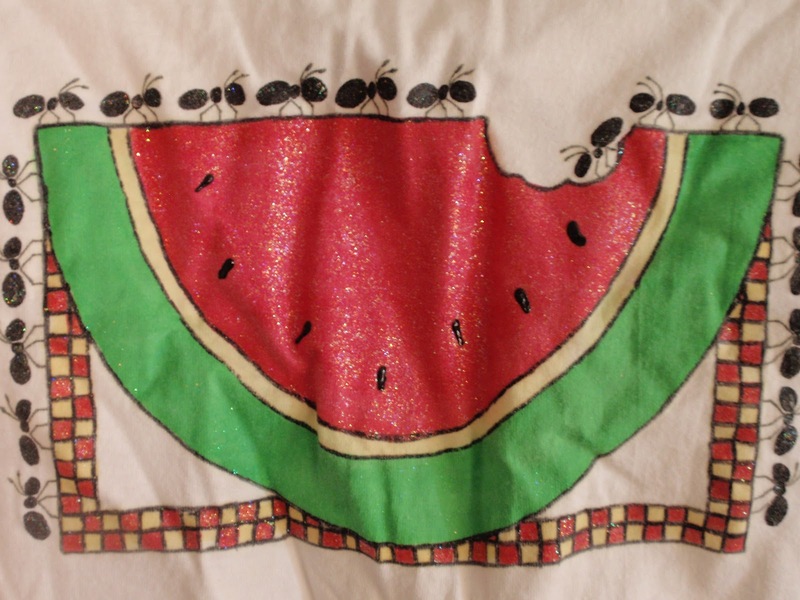 An old t-shirt with a painted watermelon. From my secret pal a long time ago.The paint is stiff! With watering mouths, the melon was opened. What the heck? It was empty! Seriously, the watermelon had turned into an empty shell! It was absolutely hollow. We were flabbergasted and very disappointed. What could have gone wrong? Watermelon + clear liquor = spiked fruit. It was a no-brainer! “Wait”, Monica said. “Clear liquor? It had to be clear? As in colorless?” The alcohol she had procured was Southern Comfort. Amber colored whiskey was what had been poured into the melon. Whiskey must be pretty powerful stuff. It devoured the inside out of our watermelon. Imagine what it does to the inside of a stomach! We laughed and decided there had to be a lesson for us. Maybe it was you can’t drink your booze and eat it too! Or maybe it was a reminder that we weren’t supposed to have any alcohol anyway as we were underage. Then again, possibly it was a message to two 18 year old college freshmen who thought they knew it all that they had a lot of life lessons yet to learn. I started the Clapotis for the knitalong. 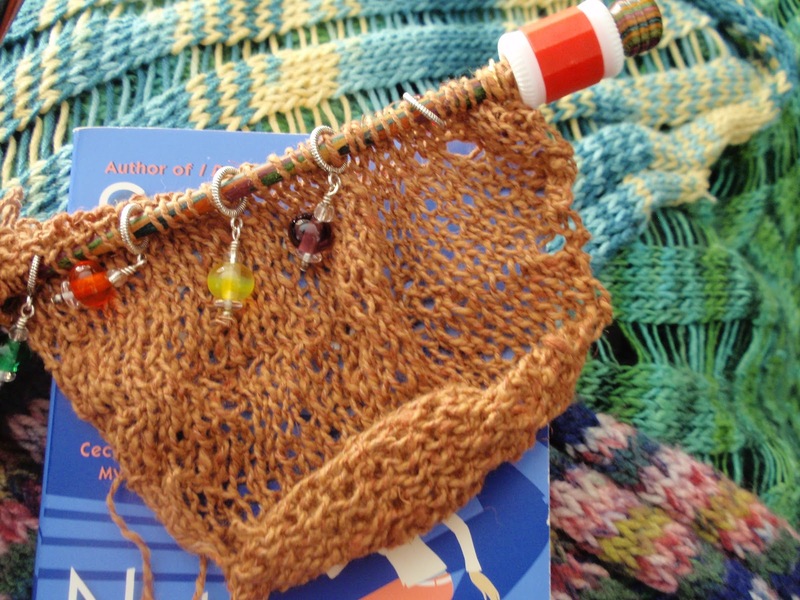 I’m using Summer Breeze by Thomas Kvist. I swatched (for once!) 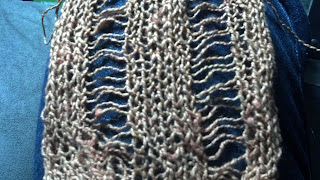 to see how it would do with the drop stitches and it’s going to work well. A swatch...but this isn't the real color. I like the color. It’s tan I guess, unless I pull out the box of 64 colors and do a match! 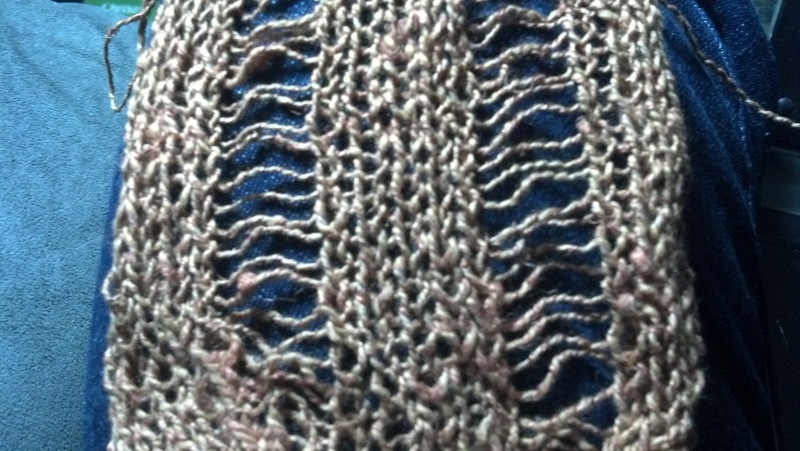 The newest Clapotis. That's the real color! I finished a book called “Not a Girl Detective”, by Susan Kandel. It was action packed and reminded me of a Stephanie Plum book. The heroine, Cece Caruso, writes biographies of dead mystery writers for a living and collects vintage clothing. While researching her next book, the life of "Carolyn Keene," the fictitious name several authors used to create the Nancy Drew mysteries, she has to solve a murder before she becomes a victim herself! 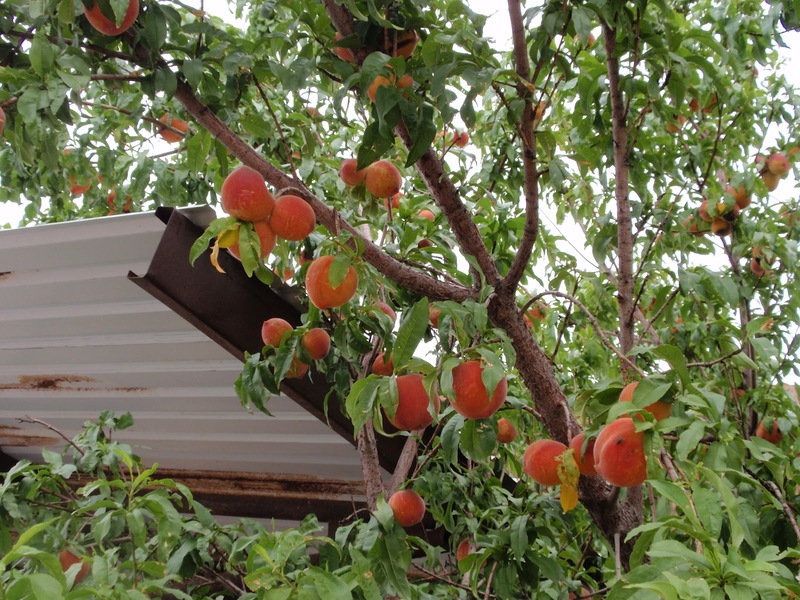 I was so afraid the wind was going to blow all the peaches off the tree. And we were surprised it even had peaches since it froze again after it had blossomed. But for some reason it was covered! We picked all we could reach. Then Alan picked more after climbing the ladder. There were ten grocery bags full in all. 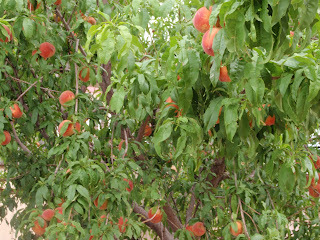 And the tree was still covered with the peaches that weren’t quite ripe! 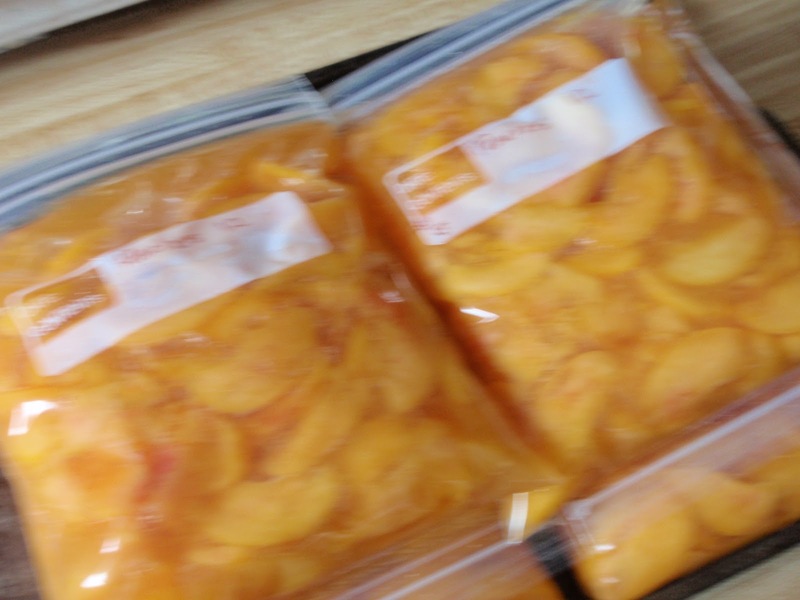 I blanched peaches and peeled peaches. 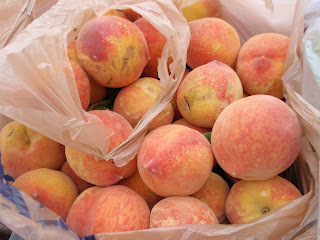 I cut peaches and ate peaches and cut some more. Finally all were done and ready for the freezer. There were 23 quart bags full. 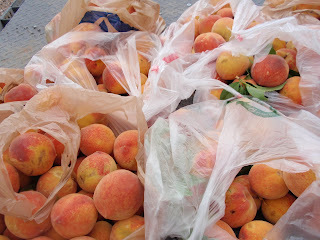 There probably would have been more but like I said, I ate peaches! 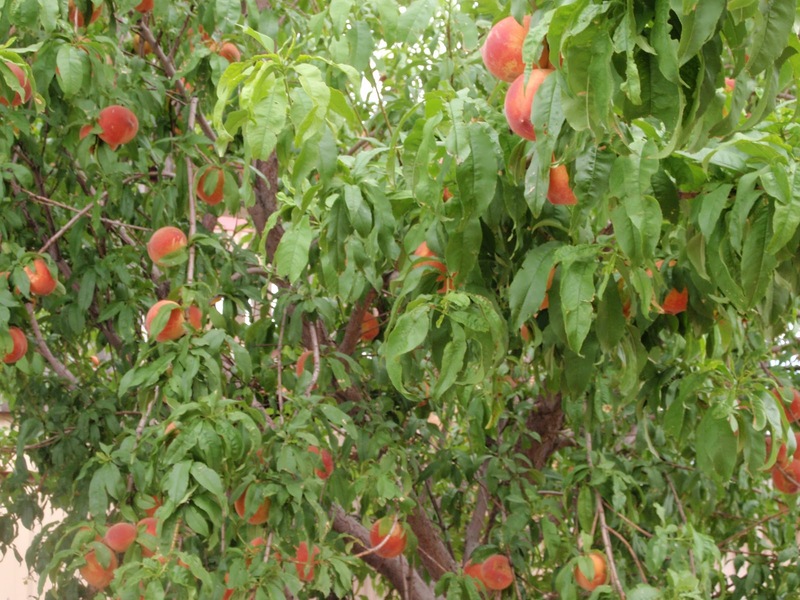 There were tons of peaches on this one lone tree. Blurry bad picture...but you get the idea! Alan read somewhere you could infuse peaches with brandy. I told him I guess we could try. But you know brandy is not a clear liquor. 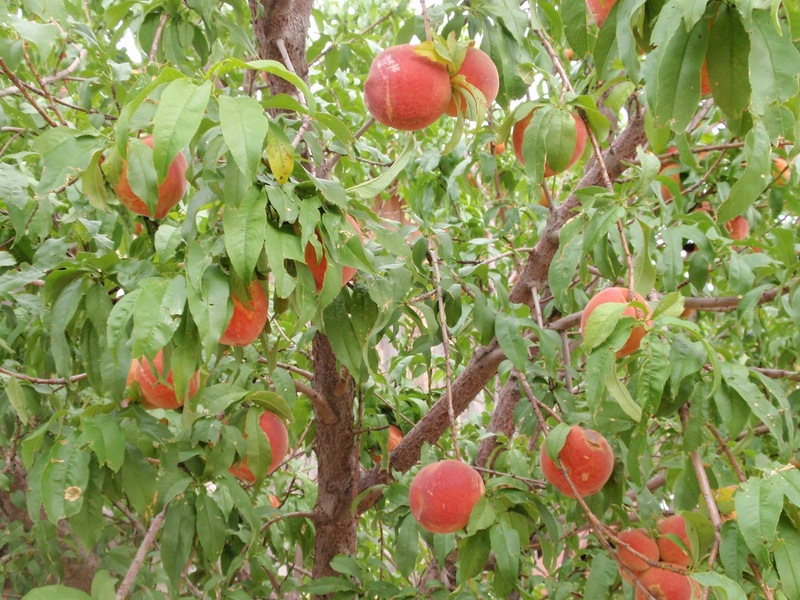 I can't believe all the peaches! I *love* peaches. Mmm peach cobbler.